The LZ variations are out of this world. With such an open position, slight variations lead to entirely different games. LZ itself seems to have a hard time figuring out the best move, probably in part because of the ladder. C2 was a slack move that gave white a losing position (~40% win). 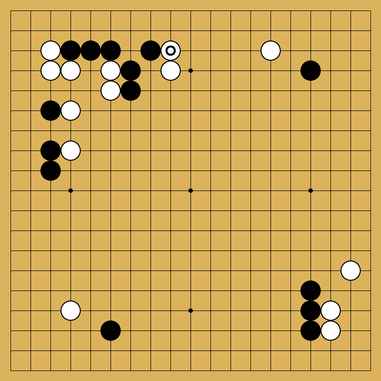 LZ’s favorite move is G9, which combines with G7 and the ladder aji. It takes quite some analysis time for this move to surface. White might want to do the H4-H3 exchange first to prepare for the moyo reduction. If not, later on black might choose to sacrifice the F3 stone. H4 works well with G7. 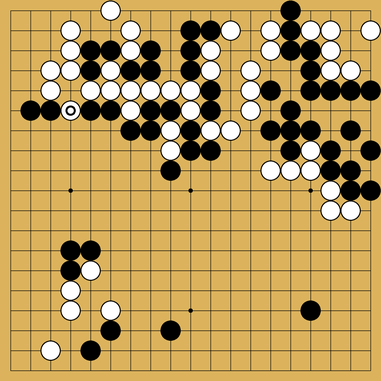 In response, black simply protects the territory. B5 is a large sente move for white. LZ also likes the lower right (Q3 or R3) but that leads to a slightly lower win rate. 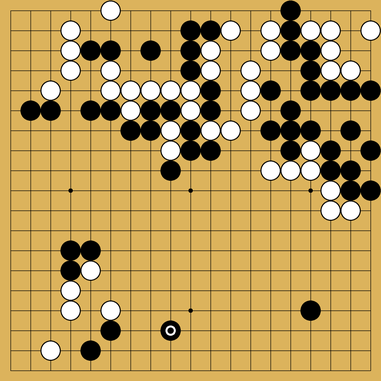 Considering that white’s best move leads to a lost game, and that the position is very open, it could make sense for a human player to try a more aggressive path. Looking back I think I should have considered r3 and r4. This study group is helping me realize I don’t search wide enough for candidates and miss a lot of good moves because of that. Board 8 is up. Anyone at any level is welcome to share their analysis of the position. I’ll start this one. No peeking until afterwards. 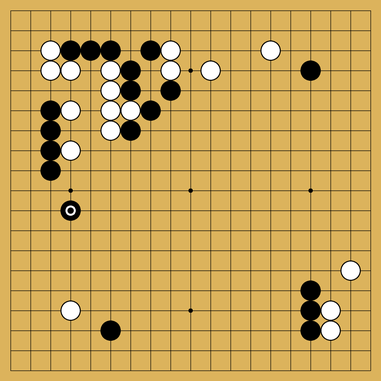 I found a good sequence starting with R14. However this is only LZ’s second choice, because there’s apparently an intolerable white weakness I overlooked in the top left. many options here that dont look particularly bad imo. strengthening the corner group before doing anything else seems unavoidable though. maybe im being too careful? other than from comparing notes with you guys, which is awesome! , i feel i benefit most from the time limit involved. there seems to be a fine line for me, where on the one side i get lost in local variations and spend loads of time pointlessly and on the other i switch to tenuki mode too quickly, neglecting local options, like shape moves or attchments. its not easy to find the right balance. Board 9 is up. Anyone at any level is welcome to share their analysis of the position. PS: I’m also interested in any meta feedback you might have. Are you happy with the board positions I’ve been choosing? The constraints and format of this study group? Anything you’d like to see done better? Are you happy with the board positions I’ve been choosing? I think I really struggle to find the “pro” moves in situations like this, since I can’t really read well enough to figure out running fights. Even on a game I’ve gone over before, there’s too much complexity for me to really know what the “best” way to proceed is. Meta feedback-wise, I like the variation! The more middlegame-ish ones are hard for me, and often frustrating since some of the lines seem to be so much deeper than what I’m capable of reading. However, that’s also what I need to work most on. No pain no gain!